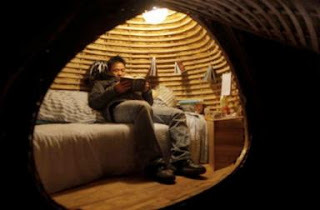 A Chinese, Mr. Dai Haifei has created an egg shaped low cost mobile house in Beijing. It is made of bamboo strips, steel bar, grass seeds, wood chips and water proof materials. It has cost about $965. It is useful for migrant laborers who are poor. It has one meter wide bed and have a facilities for washing except a toilet facility.